For being the fourth-largest Amish settlement, the community in Geauga County, Ohio, often seems to go overlooked. 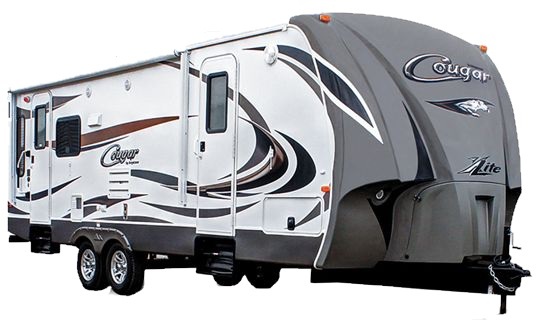 That is probably because of its nearness to Holmes County, a popular tourist destination. But this is a large settlement approaching 20,000 Amish in size, so it gets some tourist visitors, and therefore has some attractions, like food. Mary Yoder’s Amish Kitchen, located in Middlefield in the center of the community, is one of the more popular places. According to this profile in NE Ohio’s News-Herald, the restaurant regularly hosts 1500 people per day, serving PA Dutch-style fare like noodles over mashed potatoes, and date nut pudding. 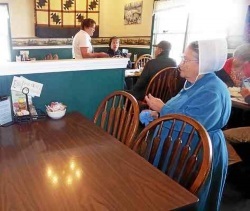 Although a portrait of Mary Yoder hangs in the restaurant’s foyer, and it employs Amish folks in the kitchen and a few as servers, it is not an Amish-owned restaurant. Like many other businesses in the community, it is owned by a Mennonite couple. But a month after Mary Yoder’s Amish Kitchen opened, Hall was killed in an auto accident, so she never got to see the popularity resulting from her vision, Rasmussen said. So it sounds like Barb was born Amish, and then likely chose not to be baptized into the church, then married a non-Amish man. The Amish religion emphasized a separation from mainstream life of Yankees, as non-Amish people are called by the Amish. Their faith was derived in the 1600s, when they split off from the Mennonites in Switzerland and immigrated in the next century to America, where William Penn promised sanctuary and freedom of worship in what became Pennsylvania. There, the Amish became known as Pennsylvania Dutch. “Yankees” is the term Amish in this community use for non-Amish people (in most other places, the word is “English”). Saloma Furlong, who grew up in this community and used the term regularly, once passed on a theory as to why Geauga Amish use “Yankee” (ultimately sourced to our friend the late Stephen Scott). This article also raised an interesting question – Is this an “Amish restaurant”? After all, it has “Amish” right there in the name. The clues about the ownership of Mary Yoder’s is clear to those who know how to look. “An Amish woman would never have her name on a business,” Morris said. This also leads to the question, what makes a thing “Amish”? Does the full ownership of the business need to be Amish? Is it enough that Amish people work there or produce the goods? What if there is only a partial Amish workforce? At Mary Yoder’s Amish Kitchen, most of the Amish among the business’s 75 employees do work in the kitchen, so that lines up pretty well with the name. Just a few work as servers. Maybe all that doesn’t matter, if you’re just hungry and out for a solid meal. I can’t speak personally about the quality of the food here, but it seems to get pretty good marks, with over 500 Google reviews giving it a score of 4.2, and a 4.5 rating on Facebook. I’ve had a pen pal (more like a sister) since 1966. She’s always lived in the suburban Cleveland area. She & her husband visit Amish areas in their “neighborhood” every year. I first heard the term “Yankee” (referring to herself) from her, many years ago. She knows how much I enjoy all things Amish, and sends me photos of her travels. I think “Yankee” is probably more “modern” than “English,” come to think of it. I don’t mind either moniker! I’m always impressed by the ways the Amish find to bend rules in order to make a living and still observe their ordnung. I do not like going to Amish tourist destinations because you do not know if it is Amish made. Restaurants are different because they are serving Amish style food. I’ve eaten at Mary Yoder’s restaurant lots of times.. They’ve got a decent salad bar (All you can eat Soup and Salad), but usually we wind up getting a Penn Dutch family style meal.. yumm.. They also sell great pies.. before I started growing my own rhubarb, we used to get a Rhubarb pie for holidays there.. best in the county! The term Yankee makes since as that was the term migrants used to call native born Americans in the mid-1800s during the height of the “Know Nothing” movement. And considering the main targets of the Know Nothings were Irish and German immigrants, and the movement was strongest in the Northeast and mid-west its not surprising that a community of German speakers would use a term to describe the non-Amish around them that was itself used by those who were English (Anglo-Americans) of that era. It’s weird how the Amish seem to preserve not just old ways, but also old terms that very few people even understand the real meaning or origin of anymore. The original term Yankee was used frequently by “know nothings” not just to refer to the modern patriotic definition we recognize it as today, but also to the English old stock America (at least that was the case during the 1840s-1860s) before the U.S civil war gave the term its modern meaning. Interesting AJ, never heard that. I am now living in South Carolina and I am referred to as a Yankee, I am from Minnesota and I am proud of it. Also. if an American goes to Europe, we are all called a Yankee. It seems a bit exploitative to be using the word Amish. And yet – anyone can own a Chinese restaurant, or an Italian Restaurant without actually being Chinese or Italian – and I’ve never thought of that as being exploitative. It has something to do with religion for me. I think. I’m saying it rings a little hallow ethically. However, they employ plenty of Amish and I would hate for them to lose their jobs over this. I think this is a conundrum for Amish going into this century. Which they started themselves in the last century – tourism specifically catering to the Non Amish by the Amish themselves. In the world but separate is hard to achieve in this day and age. And there are going to be compromises that will change the Amish forever. Judith thanks for your comment and raising this question. It’s an interesting one. What if all the kitchen workers are Amish, or a majority of them? In some way then the name would be quite accurate. I do understand how this question gives people pause. It has become successful over the past 18 years and we have been able to sell thousands and thousands of dollars worth of products for our local Amish families. While I have certainly not gotten rich, I have enjoyed working with them and having a business right here at home. Now….if I had not used the name Amish in my business title I can all put promise you that I would have failed in the first year. You might say “too bad…you should because you are exploiting the Amish” but that is certainly not the case. The ones who would have lost out the most are the 45 Amish families who had high hopes of selling their products and having a bit of extra income. I can absolutely promise you without a doubt that they have made a far greater income than I have. If they were feeling exploited I don’t really think that the families would have continued to sell their products here for the past 18 years, nor condone the simple one on one car tours I do to their farms. The fact is the Amish want tourism as much as the rest of us and they know that it is their name that draws people in. So people can talk all they want about products being authentic and whether or not something is of better quality because it has the Amish name on it…but when it comes right down to it most Amish folks know that they are a tourism draw and they enjoy the profits from it.